The Windy 900 was commissioned by Marintek of Istanbul, Turkey, for building in their factory on the Asian side of the Bosphorus. More recently, production has been taken over by F & A Yachting. She is a comfortable small cruiser, intended for a family or two couples. Although small enough to be easily single-handed, she is large enough to handle extensive offshore and trans-ocean passages. We have drawn two rigs for her. The taller of the two is powerful enough to give good performance for racing and has the facility to fly masthead asymetrical spinnakers, for exciting reaching performance. The short rig uses the same foretriangle with a smaller mainsail. This gives easier handling for family sailing but still offers reasonable performance in stronger conditions. Both rigs have swept spreaders to give a stable configuration, the short rig having one set of spreaders and the tall tig having two sets. Down below she has 4 permanent berths and 2 settee berths in the saloon. 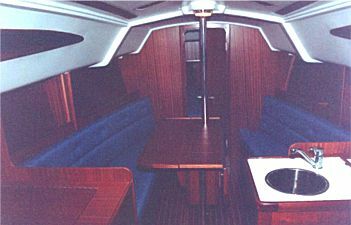 The comfortable aft cabin has a vast double berth for a yacht of this size. With L-shape galley, permanent chart table and large heads, she has an interior that offers pleasant life afloat. Her hull has a very long waterline, to maximise performance and load carrying ability. With clean lines and flat buttocks aft, she will have sparkling performance on all points of sail, particularly offwind. Her bow is fine at waterline for wave penetration and low drag but it is well flared to a broad foredeck for reserve buoyancy to resist burying when pushed hard offwind. With a modern and efficient bulbed fin keel, her stability is excellent, giving positive righting moment to 145 degrees. 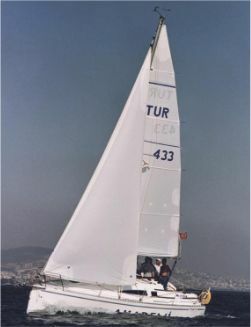 Her shaft mounted rudder is also an efficient high aspect foil and can be wheel steered if preferred to the standard tiller. On deck, she has a cockpit long enough for sleeping. It is open aft for fast draining and to give walk-through access to the swim platform. If fitted with wheel steering, a folding helm seat will be fitted across the opening. Under the cockpit is a large lazarette to port, accessed via a hatch in the seat. The mainsheet traveller spans the cockpit and is sunk flush into the seat tops to permit sleeping in comfort. The Windy 900 is a comfortable and efficient small cruiser, well suited to family coastal passages or bareboat chartering. For the more serious sailor, she can take you round the cans or around the world. 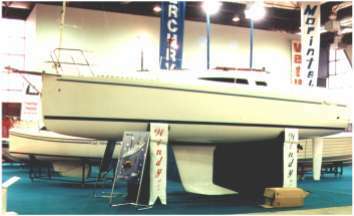 For a smaller yacht in a similar concept, see the Windy 580, also from F & A Yachting. Click for stability graph or List of drawings.